The moonflower is one of the most important flowers that bloom at night. Yet there is no moonflower in the collection. Why? I simply could not get a good shot last summer. What with the wind and their tendency to intertwine I could not isolate a single flower that would pose for me and sit still. 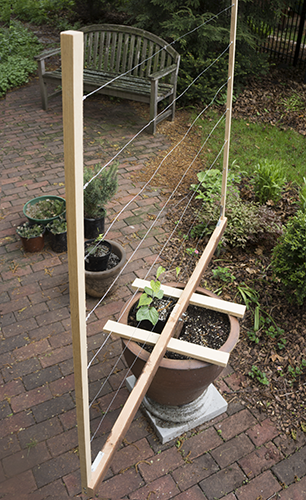 So this last weekend I built a special portable trellis that will keep the vine trained to behave and can be moved in case of breeze. You can see the moonflower seedling getting ready for training in the photo. I will keep you posted. Can’t wait to see the results. When do anticipate the flower will bloom?